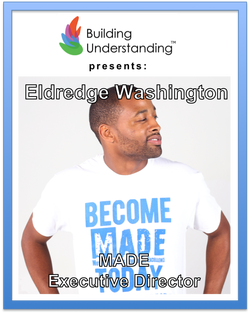 Eldredge E. Washington is the Founder and Executive Director of Motivated Adults Developing Excellence (M.A.D.E). Their mission: To help improve the lack of positive mentors available for middle and high school students by providing mentors that will broaden students’ awareness of personal achievements leading to them to ultimate success. Join Eldredge Washington to learn about his work leading Motivated Adults Developing Excellence (M.A.D.E) and their upcoming MLK Day service project (BUDS is partnering). MADE is a nonprofit organization that focuses on family and community development by mentoring middle and high school students. 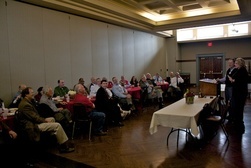 Due to his unique tactics and ongoing success, Eldredge, also known as Made Mann, is expected to be a vital component in the success of our community youth development. A belief MADE pivots on is that 'If you see more and want more, you will eventually do more with the support from the people in your life.' Through the M.A.D.E organization, Eldredge has been able to expose youth to opportunities of empowerment and higher living that builds back the fundamentals of strong families in our communities.